Alibaug, beach playground for India's rich and famous, is a refreshing Mumbai getaway. It's possible to enjoy Alibaug in a day. However, if you can, take the extra time to relax there and go beach hopping. Alibaug is located 110 kilometers (68 miles) south of Mumbai. The quickest way of getting there is by boat to Mandawa Jetty from the Gateway of India in south Mumbai's Colaba neighborhood. It takes about an hour to reach Mandawa Jetty by ferry, or 20 minutes by speedboat. From the jetty, the beach is another 30-45 minutes south, by bus or auto rickshaw. The bus is included in the ferry price. Ferries operate from morning until evening (around 6 a.m. to 6 p.m.) throughout the year, except during the monsoon season from June to September. Services usually resume again in late August, but it depends on weather conditions. If budget isn't an issue, try Uber's convenient new app-based UberBOAT service. Launched in January 2019, it provides speed boat hire between Mumbai and Alibaug's Mandawa Jetty. The service operates from 8 a.m. to 5 p.m. daily. You can expect to pay 5,700 rupees one way for a speed boat that can fit up to eight passengers. The cost of a larger boat for 10 or more passengers is 9,500 rupees one way. In addition, lesser-known ferries that carry motorcycles depart from Ferry Wharf at the dockyards near Mazgaon. The ferries go to Revas Jetty and take approximately an hour and a half to get there. If you're driving, Alibaug can be reached by road via the Mumbai-Goa Highway (NH-17). The journey takes three to four hours from Mumbai (depending on traffic). Visit Alibaug from November to February, when the weather is the coolest and dry. From March onward, the temperature starts rising before the monsoon starts in June. Due to its close proximity to Mumbai and Pune, Alibaug has become a popular weekend destination and it often gets crowded then. Other busy times are the summer school holidays in April and May, and the festival season over Diwali in October or November. Weekdays are the most peaceful. Alibaug isn't just an iconic beach destination. It was established in the 17th century and has quite a bit of history behind it. There are numerous old forts, churches, synagogues, and temples all waiting to be explored. Kolaba Fort is the main attraction. Most of the time, it's surrounded by ocean. However, you can walk out to it during low tide, or go in a horse pulled cart. Otherwise, take a boat. Kanakeshwar Temple, on a hill near Alibaug, is also worth visiting. Those who can climb the 700 steps to the top are rewarded with the sight of colorful conclaves of smaller temples and miniature god statues. If you're more interested in fun in the sun, you'll enjoy the wide variety of water sports on the beach. Nature lovers shouldn't miss the new Native Biodiversity Garden adjoining Teenvira Dam on the Mumbai-Alibaug Road. This eco-friendly and sustainable solar-powered garden is both experiential and educational. It's divided into 17 themed sections such as medicinal, butterfly, wetland, spices, and sacred grove. Opening times are 9 a.m. to 1 p.m. and 2 p.m. to 4.30 p.m. daily. The new Mandawa Port precinct, at the jetty, has a cool seafront restaurant and bar called Boardwalk by Flamboyante. Funky Kiki’s Cafe and Deli also faces the ocean there and is a popular breakfast spot. Hotel Sanman is the place for mouthwatering local Konkani-style seafood. This restaurant has been in business for more than 35 years. It's located in Israil Lane, opposite Chirag Executive in Alibaug. Also at Mandawa Port, Beach Box consists of recycled shipping containers that have been transformed into a cluster of hip boutiques. Bohemyan Blue is grooviest clothes store and garden cafe in the area. It's located on the Alibaug-Revas Road at Agarsure, between Kihim and Zirad. The beer is cheap too! Perfect for a chilled out afternoon. There's also rustic luxury tented accommodations with a swimming pool behind the premises, ideal for glamping. All kinds of activities are offered including yoga, cycling, go-karting, rock climbing , and horse riding. Mumbai's 18-year-old contemporary art gallery, The Guild, relocated to Alibaug in 2015. Visit it on Mandawa Alibaug Road at Ranjanpada. Also located on Mandawa Alibaug Road at Rajmala is Lavish Clocks, which sells 150 types of clocks modeled on antique timepieces. Dashrath Patel Museum, at Bamansure near Chondhi Bridge, showcases the works of this groundbreaking Indian artist. It includes painting, ceramics, photography, and design. Nostalgia Lifestyle is another trendy Mumbai business that's moved to Alibaug at, Zirad. They stock a gorgeous range of indoor and outdoor furniture, water features, paintings, home decor, and swimwear. Varsoli, 2 kilometers north of Alibaug (it's on the outskirts of the Alibaug town center). Kihim, 10 kilometers north of Alibaug. Awas, adjoining Kihim beach to the north, it's lesser frequented and quieter. Akshi, 7 kilometers south of Alibaug. Nagaon, 10 kilometers south of Alibaug. It's sometimes referred to as "mini Goa" during peak season. 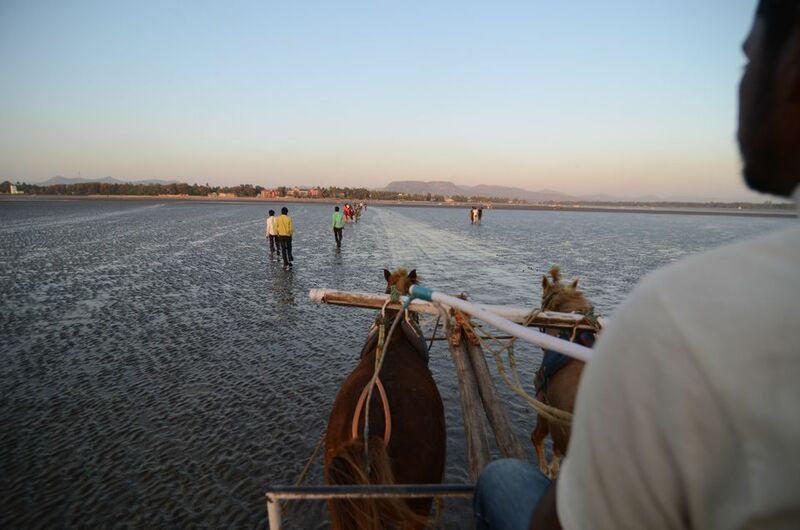 Most of the beaches have become polluted and touristy in recent years, with activities such as camel cart and horse rides (they don't operate during the monsoon season though). Water sports have proliferated at most beaches including Varsoli, Nagaon, and Kihim. Nagaon beach also offers boat access to Khanderi and Undheri forts. Akshi is the best bet if you're after a secluded beach, especially during weekdays. It's popular with nature lovers and bird watchers. Kihim is also known for birds and butterflies. There are a range of accommodations around Alibaug, from luxury resorts to basic cottages by the beach. The cottages are popular with groups, as the whole property can be fully booked for privacy. Near Alibaug: the Radisson Blu Resort comes fully-equipped with a health spa, perfect for pampering. Rooms cost upwards of 6,500 rupees per night for a double. Near Varsoli: If you're looking for a reasonably-priced place right on the beach, you can't go past Sanman Beach Resort. It's an offshoot of Sanman restaurant, so you know the food will be tasty! Near Kihim: Outpost @Alibaug is a boutique family-friendly resort, slightly inland amid nature, that was previously called the Windmill Resort. U Tropicana Alibaug is another popular resort a few kilometers from Kihim beach. The beautiful Mango Beach House at Kihim is a short walk from the beach and has a swimming pool. Rates start from about 5,000 rupees per night. Casa de Kihim has a handful of attractive wooden huts in garden setting a couple of minutes walk from the beach. If you're after a budget cottage close to the beach, Sanidhya is popular. Alternatively, there's nature and delicious food at the rustic homestay Mauli Village, inland from Kihim Beach. Mama's House is a modern Greek island themed homestay with a swimming pool on the Alibaug-Revas Road. Near Awas: Jokalekar Cottage is a hit with families. There's also Ghanvatkar Bungalow at Zirad, which is inland from Awas beach. It's good for a budget stay and has a swimming pool. Mango Beach House & Spa at Awas has four luxurious cottages (eight rooms) with pool on a coconut plantation near Zirad, priced from 4,500 rupees per night. Near Nagaon: Sidz has comfortable cottages inland from Nagaon Beach, ideal for groups or families. Iora Cottages has funky budget accommodations made out of up-cycled shipping containers about 10 minutes walk from the beach. Dolphin House Beach Resort is a decent budget place just around the corner from the beach. Nagaon Eco Center has tents and huts under the trees right on the beach. For something different try Karpe's Wadi agro-tel farmstay. There are numerous other budget homestays and cottages set back from the beach as well. Other Locations: If you're after a boutique private villa close to Mandawa Jetty, Ccaza Ccomodore is the place! Gandhar Eco Lodge offers a quiet experiential village experience in Thal. For more private bungalows and villas, take a look at the listings on Air BnB. Alibaug becomes dangerous during the monsoon when tides are strong and the ocean rough. There have been instances of people getting swept away from Kolaba Fort and drowning. Therefore, it's best to avoid the water at this time of year.